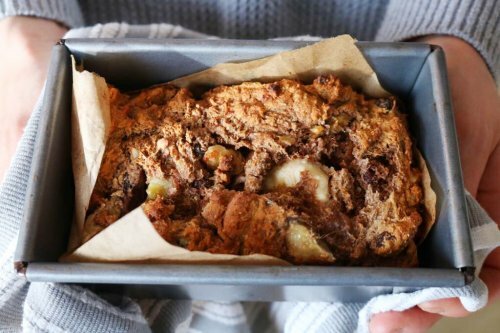 There are so many great banana bread recipes out there and this takes all my favourites bits from all the recipes I've tried to make the most delicious and nutritious banana bread that you can eat any time of day. It makes the perfect breakfast or snack especially when teamed with salty butter or a smother of your favourite nut butter. Need I say more! No eggs or butter – it’s not a typo! Mix the mashed bananas, water and vanilla together then add to the bowl. Transfer the mixture to a 750g (1 1/2b) loaf tin lined with baking parchment.